Have you read Bezos' 2016 letter to shareholders? He cites three core principles that Amazon relies on to stay relevant. embrace external trends - you're not going to change them, shouldn't you build on them and enjoy the "tailwind"? Many of the manufacturers I talk to balk at much of this in practice. In theory they agree it all sounds good. But when it's time to apply it to their company, well then there's plenty of "Well they're big enough to take risks." and "It's easy to adjust in software, we're a factory with machines and overhead." That's a shame - because manufacturers are missing key opportunities. In fact I would argue that two of the most important assets which will characterize the balance sheets of successful manufacturers in 5-7 years will be items that are rarely even listed now. That doesn't require Ari Wallach's (@AriW) transgenerational future planning, but it does require a longer (and wider aperture opening) than most corporate strategy. Let's tackle data first. Two often companies think of data in aggregate - and certainly the opportunity to mine insights is important. For instance, monitoring your website chat and discerning that lunchtime on Thursdays is the busiest time for incoming chats lets you staff accordingly. Beyond that sort of aggregate insight, the real power in data lies in the individual insights - let's call it quasi qualitative - and the value to others. In the former is power to differentiate your company to buyers who increasingly expect personalized experience. The latter holds enormous potential as a monetizable asset. But first companies have to overcome a mindset barrier. Capital equipment manufacturers think of themselves as machine builders. That involves software and interactions - but they see those as byproducts or tangential. That conflicts with the evolution of manufacturing which is increasingly about the data - and in which machines are essentially commoditized buckets of data collecting sensors. Think this one's just some sort of a joke? Think this sounds outlandish? Wal-Mart doesn't. Its October '16 patent filing that was just made public on May 5, 2017 speaks to precisely this trend. It will track your expiring milk and how many times you launder your jeans. The data represents soooo much more however. Let's just consider a few examples from the toilet paper roller. The point is clearly that the data could enable enormous commercial and operational efficiencies. 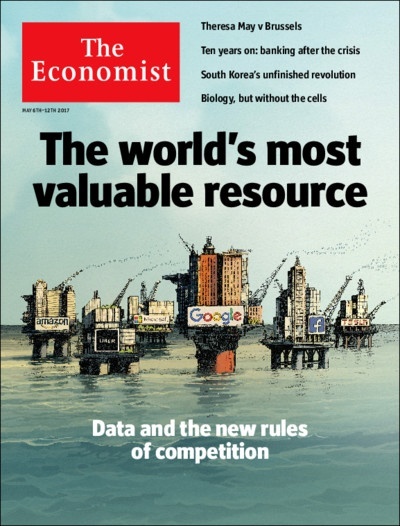 In fact, the cover of the 6 May issue of The Economist speaks for itself. And therein lies a massive potential asset that could be monetized. It will take time to accumulate the data - and there are privacy, anonymity and proprietary barriers to work through. But capital equipment manufacturing companies (and their sales channel) that can make the mind shift from steel bending to data will have taken a huge step toward a 2020 manufacturing market strategy. The other area is the process and expertise with which they grow. Most industrial manufacturers think of their product IP as their most significant asset. For some it is. For many it's probably the building that they occupy and the future revenue stream of spare parts. But for many it could become the IP around their revenue growth. The simple fact is that most industrial manufacturing companies have invested enormous resources in optimizing their manufacturing operations...and on the revenue growth side they maybe hire another rep, attend another trade show, run another add, refresh a stale website, or really kick it up a notch and bring someone in to talk time management with their sales reps. There's no analogous rigor focused on revenue growth and manufacturing market strategy. And that's absurd given how buying habits have changed. Silos need to be busted and the revenue growth function needs to be integrated across PR, marketing, inside sales, field sales & customer service as outlined in this narrated 10 minute "picture book." On the manufacturing line when there's a defect, things stop. And they stay stopped until its cause is discovered and fixed. One the sales side quotes are issued that everyone knows will never close...and nobody stops sales to understand why, much less change things. There's an opportunity here. Part of it is mindset - simply viewing the revenue growth function as a process to be managed, improved and refined just as manufacturing operations. And part of it is data and tools. Product quality measures are very concrete - a part meets them or it's a defect. Traditionally revenue growth metrics were much more opaque. That's changed - and while buyers are using the internet in ways that frustrate traditional sales methods, the good news is that same internet use enables revenue growth teams to understand and measure with much more accuracy what buyers are thinking and doing. Content marketing, marketing automation, granular metrics & analytics and behavioral observation combine to provide the insights that are necessary to develop, implement, test and improve the demand generation, lead generation, sales and retention functions. These tools provide rich individual, qualititative data upon which good decisions are based. This process will create value in a number of ways. But a quick clarification first - this "process" is different than the commonly used term "sales process." The latter is a critically important element of the revenue growth process opportunity, but it's only an element of it. Cumulatively this is a revolutionary change - every bit as significant as the shift in manufacturing operations to lean, JIT and quality. This revenue growth IP will represent an enticing capability for which an acquirer would potentially pay more - an asset with value. It will increase valuation in other ways as well. With accurate forecasting and a predictable, repeatable process for revenue growth, the future earnings will be more predictable and secure. The reality for most industrial companies, however, is that their manufacturing market strategy is focused on products. That's the lens through which they see the world - they have market cataracts. Products are merely the medium by which they improve customers outcomes - and it's the problems, known and unknown by prospects, on which attention must be focused. Once that shift is made then they can begin to see their product roadmap in the context of disruption and envision opportunities to leverage the cloud, IoT and more - all around the data. And they'll be able to reengineer their revenue growth process to improve outcomes. Both result in assets with likely future value, and both represent enormous opportunities to leapfrog competition which remains fixated on incremental product improvements. Can CEOs shift company mindset? Some will, just as some improved manufacturing operations in the US to compete globally. Of course, many will not. “Intitum didium facti”; the start is half the deed. Want to prime your brainstorming pump by exploring some of the disruptive trends that are going to shape industry over the next ten years? This free "Strategy Roadmap & Question Guide" is designed for boards and executive management teams to stimulate thought and discussion. Get your free copy here.